Using the Lazy Susan is the best way to move large pallets of product around. It is extremely simple to operate and easy to set up. It can go on top of any work bench, desk, or table; it is great at ground level. This can hold a high amount of capacity, and rotates very smoothly. This equipment will allow you to rotate as needed so you can do your job. For example, you may need this to do your seamless wrapping, your loading, and unloading job. We carry many different sizes because we want you to get exactly what you need. If you are searching for the simple way to turn heavy objects, then you have found the right piece of equipment. A very strong model of this machine is our Air Bearing Turntables With this you can rotate 1000 pounds by only giving 10 pounds worth of force. Instead of moving yourself or the object, all you have to do is give a little force, and you are all set. Of course this is very easy to install so you don’t have to worry about that when it is delivered. This is maintenance free, there are not many ways one could break this piece of machinery. The top floats on a layer of compressed air. When buying this product make sure to also buy the compressor. Once you do your equipment will be ready for use. 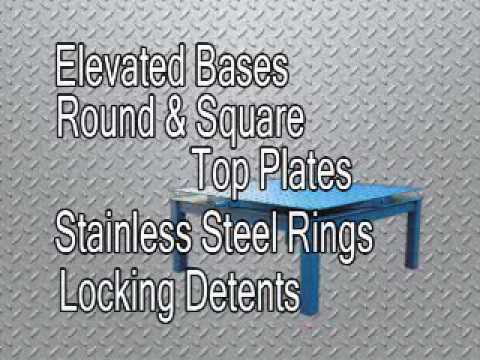 We can sell you our Stainless Steel Low Profile Turntable if you are looking for a material that is corrosive free. If you are using this outside, the stainless steel one is highly advocated because, the outdoors can ruin products, and we wouldn’t want that to happen to your equipment. This one comes in 3 different sizes just for you. It’s even part of the free freight program! This Lazy Susan can hold up to a massive 5000 pounds. This is a great turntable, especially for those who will be working with it outside. We even have a perfect turntable for a photo artist. We have a giant powered Lazy Susan for photo shoots. The width of this plat form is around 7 feet, which is definitely a good amount for whatever it may be you are taking a photo of. Most objects are within the size of this diameter. The Photo Shoot Power Turntable can hold 3000 pounds. This can make a wonderful display as well! It’s perfect for those artist you don’t have a place to store their art, especially if it's heavy, like metal sculptures. Our plates roll smoothly on metal casters. An awesome choice for 3D photo sessions. Check out all our turntables today at A Plus Warehouse!